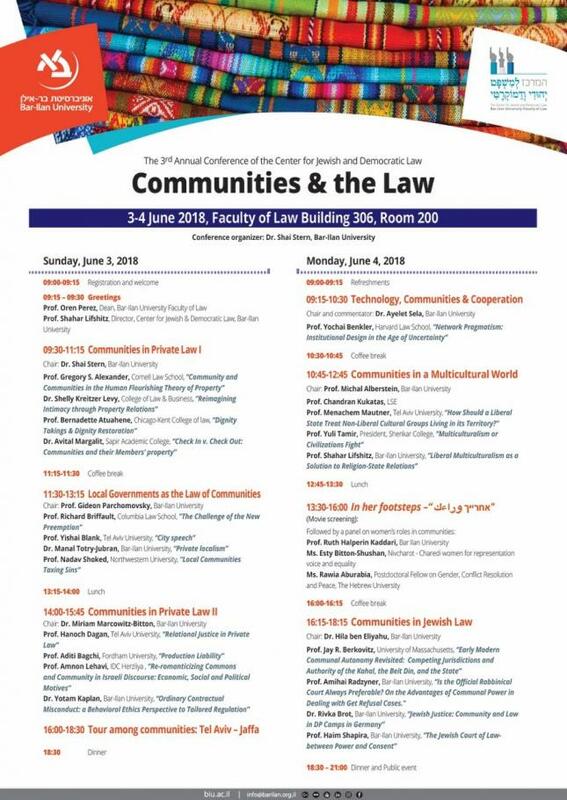 We are delighted to announce that, on Sunday 3 and Monday 4 June 2018, the Bar Ilan University law school and the Center for Jewish and Democratic law will be hosting an international conference titled “Communities & the Law”. The conference will bring together scholars from all branches of law, including private law, constitutional law, local government law and technology to discuss the role of communities in the legal, economic and political spheres. A series of panels on both conference’s days will include the role of communities in private law (focusing on property law and contracts law); local governments as the law of communities, communities in a multicultural world; Technology, Communities & Cooperation, and feminist approaches to communities. Confirmed speakers and panelists include; Prof Yochai Benkler (Harvard Law School); Prof Gregory Alexander (Cornell University Law School); Prof Hanoch Dagan (Tel Aviv University Law School); Prof. Richard Briffault (Columbia Law School); Prof. Bernadette Atuahene (Chicago-Kent College of law); Prof. Yishai Blank (Tel Aviv University), Prof. Chandran Kukatas (LSE), Prof. Aditi Bagchi (Fordham University); Prof. Amnon Lehavi (IDC Herzliya); Prof. Nadav Shoked (Northwestern University); Prof. Menachem Mautner (Tel Aviv University), Prof. Yuli Tamir (Shenkar College), Prof. Shahar Lifshitz (Bar-Ilan University), Prof. Ruth Halperin Kaddari (Bar Ilan University), Prof. Jay R. Berkovitz (University of Massachusetts); Dr. Shai Stern (Bar Ilan University), Prof. Amihai Radzyner (Bar-Ilan University); Dr. Shelly Kreiczer Levy (College of Law & Business); Dr. Rivka Brot (Bar-Ilan University); Dr. Yotam Kaplan (Bar-Ilan University); Prof. Haim Shapira (Bar-Ilan University). The full program of the conference is available here. Please direct all further enquiries to the conference organizer, Dr. Shai Stern, Bar Ilan University.